Seeking religious freedom, Joseph and Julia Atzeroth leave Bavaria and travel across the ocean to build a new life in America. Propelled by Julia’s precarious health and the lure of free land, the Atzeroths make their way to the west coast of Florida where they face wild animals, hurricanes, Seminoles, and threats from other settlers. Throughout their journey, Julia struggles to find her way, not only through the wilderness, but to an understanding of what God desires from her. Though life as a pioneer is filled with turmoil and hard work, Julia discovers that God offers grace and mercy despite her many failings. 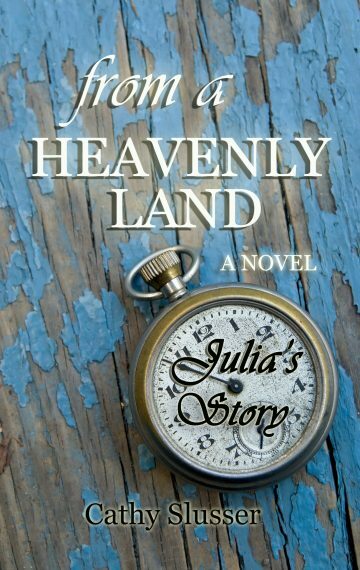 The second novel in the From a Heavenly Land trilogy, Julia’s Story is prequel to Eliza’s Story, told from the perspective of Eliza’s mother. Julia’s Story carries you from 19th century Germany to a lush tropical island, as one woman’s true story shows the determination and faith necessary to make a new home in the Florida frontier.